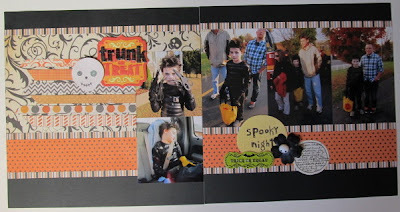 I have been scrapbooking! 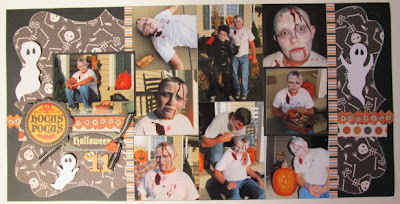 I am happy to say that all of my Halloween pics (pumpkin carving & trick or treat) from 2011 are scrapped. Go me! I pulled out my neglected October 2010 kit from Noel Mignon. (For the life of me, I can't remember why I didn't use it last fall.) 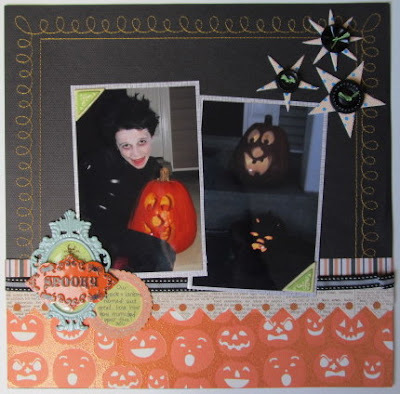 Armed with this kit, extra black cardstock & alphas, and my stack of Halloween pics, I worked over the weekend and completed ten layouts. Crazy Kev shocked me when I noticed he was wearing a mask to carve his pumpkin. He was a bit scary! 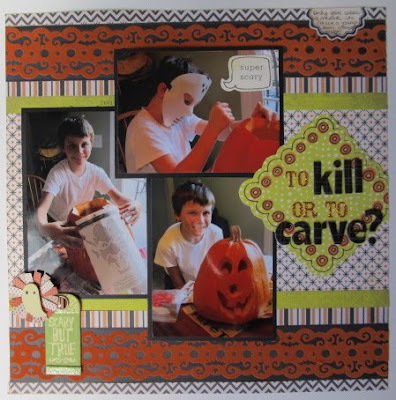 I broke out my new Martha Stewart border punch for "Carving Time" for Blake's album. I guess he was inspired to don his 'fro wig after seeing Kevin in his mask? 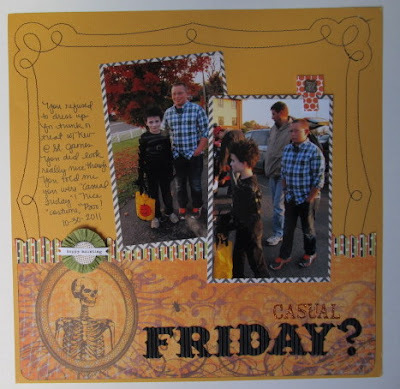 I loved the My Mind's Eye pumpkin paper for this page. Next, I FINALLY got to use my WRMK stitched cardstock for Blake's trunk or treat layout. He refused to dress up and said he was "casual Friday." Teenagers! Thankfully, Kevin dressed up. 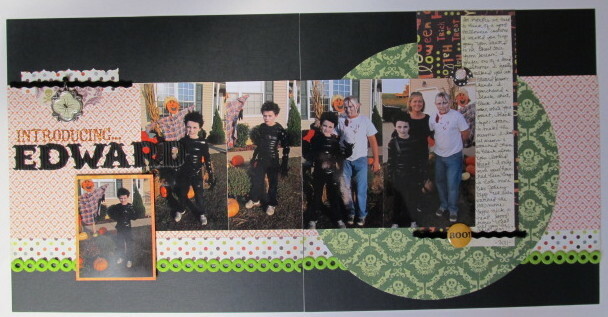 Everyone loved his Edward Scissorhands costume. 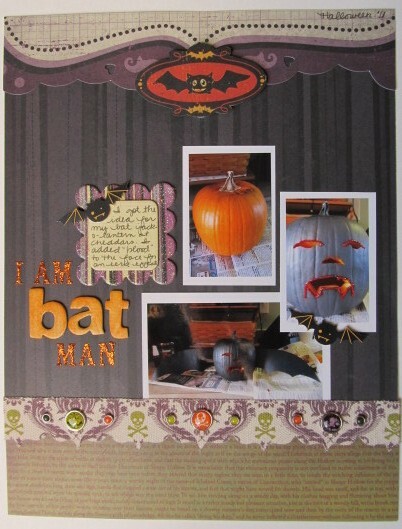 I used a sketch from Sketches for Scrapbooking Volume 8 for this 2-pager. Thankfully, Blake asked me to put make up on him before he sat out and passed out candy on Halloween! Speaking of Edward Scissorhands... This layout and the next both use sketches from Sketches for Scrapbooking Volume 8. 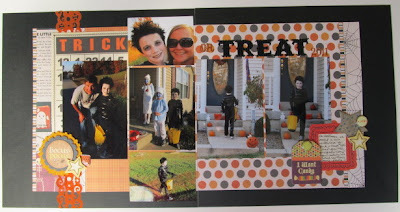 We really enjoyed trick-or-treating in our own subdivision. On a school night, it was great to stay home. 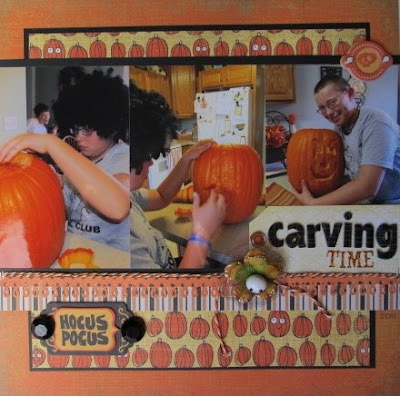 Now that Halloween is over, Thanksgiving is right around the corner. these turned out awesome! 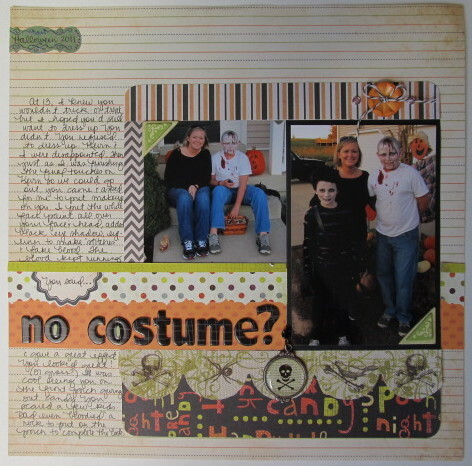 i have a million halloween pics & need to get a move on it lol. 10 layouts? You blow me away. Beautiful work Amy...it was good to catch up with what is happening in your neck of the woods. 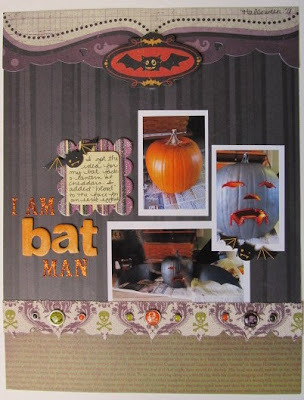 Amazing layouts Amy! Love the titles!